Our attorneys and staff have over 50 years of combined experience, handle only Social Security Disability claims, and have handled over 30,000 SSD claims. Please check out additional information about why you should choose us to represent you in your Social Security Disability claim. 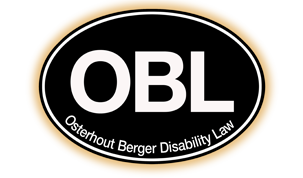 For a free consultation to discuss your SSD or SSI claim with an experienced Social Security Disability attorney, call the experts at Osterhout Berger Disability Law toll free at 1-866-438-8773. Essentially, there are two types of disability benefits under the Social Security program — Social Security Disability (SSD) benefits and Supplemental Security Income (SSI) benefits. SSD benefits are benefits paid by Social Security based on the amount of Social Security taxes you paid while you were working. Every person knows, for example, that he or she will receive a certain amount of Social Security benefits when becoming old enough to retire; SSD benefits are essentially “early retirement” benefits. SSD benefits are the same amount of benefits a person would receive when becoming old enough to retire. For example, if you would be entitled to $800 a month when you retire, but become disabled at age 52, you will begin receiving $800 a month immediately. SSD benefits are generally higher than SSI benefits and, more importantly, are not subject to reduction if you have other sources of income, unless you are receiving workers’ compensation, some types of veterans’ benefits, or are already old enough to be receiving Social Security retirement. In addition to benefits paid to the disabled worker under SSD, there are two other types of benefits in this program. The first is “Disabled Widows Benefits,” a benefit paid to a widow or widower more than 50 years old who has not remarried and who meets the definition of disability. The second is “Child’s Disability Benefits,” a benefit paid to the child of a wage earner who becomes totally disabled prior to his or her 22nd birthday. To discuss your SSD benefits with an experienced Social Security Disability attorney, please call us at 412-794-8003(locally in the Pittsburgh area) or toll free at 1-866-438-8773 (outside the Pittsburgh calling area). If you prefer, you can fill out our intake form, and an experienced lawyer will contact you to schedule an appointment. SSI benefits are benefits paid to disabled persons who do not qualify under the SSD program. SSI claimants usually have worked sporadically over the years, have not worked in a long time, or never worked, and have not paid a sufficient amount of Social Security taxes to qualify for the SSD program. In order to qualify for SSI, a claimant must be found “disabled,” but must also show that he or she meets a “needs test” by virtue of low income. Many people who qualify for SSI benefits have been on some form of public assistance and, in many cases, have been urged by their caseworker at public assistance to file the claim for SSI. Generally, SSI benefits total approximately $590 per month, and SSI recipients usually continue to receive food stamps and retain their state medical assistance card. To discuss your SSI benefits with an experienced Social Security Disability law attorney, please call us at 412-794-8003 (locally in the Pittsburgh area) or toll free at 1-866-438-8773 (outside the Pittsburgh calling area) to schedule a free confidential consultation. If you prefer, you can fill out our intake form, and an experienced lawyer will contact you to schedule an appointment.